When it comes to planning a wedding, there always seems to be a surprise expenditure around every corner. Often, this leads brides and grooms to try and find new ways to cut corners on costs, and one of the first considerations many make is whether they really, truly need to send save the dates. So, is it really necessary to send little reminders and pre-invitation notifications? In a word, yes, and here’s why: When it comes to what is arguably the most important day of your life to date, you don’t want it ruined because you didn’t give your loved ones adequate notice. Your family and friends are likely very busy people, and the best way to ensure those you truly care are able to attend your special day is to give them as much advance notice as possible. That’s where the save-the-date comes into play. Now that we’ve established the importance of sending save the dates, let’s explore some common save-the-date mishaps and blunders…and how to avoid them. Given that the primary purpose of sending save-the-dates is to let your desired guests clear their calendars and make sure to be around at a certain time, sending them too late entirely defeats the purpose. Not only that, but guests who have to travel for the festivities will have to book a flight, secure a hotel, take time off of work and so on and so forth. The more of a heads up you give them, the more they’ll appreciate it and be likely to find reasonably priced flights and hotels. While it’s possible you won’t have an exact venue nailed down by the time you’d like your save-the -dates to hit the mail, not including at least a rough idea of where the event will be is doing your guests a major disservice. Not only that, but it sort of defeats the purpose of sending them in the first place, because your guests won’t be able to make travel plans accordingly. Even if you don’t have an exact address nailed down, print the city, state or country in which you plan to wed so that your guests can start exploring travel options as soon as possible. It’s an age-old problem almost every bride and groom deals with – if you’re shelling out a lot of money for each guest, do you really need to invite “plus ones” who you may not even know? While it can be painful financially, the short (and polite) answer is yes. While it is important to invite plus ones in the first place, it’s also critical that you make the fact that you’re doing so obvious on the save-the-date. This gives single guests an opportunity to find someone to accompany them, should they desire, and it will also help them arrange travel and hotel plans, if need be. It’s entirely too easy to get caught up in the excitement of wedding planning and want to invite everyone you’ve ever met, from your third-grade teacher to that girl who walked your dog when you were out of town. Sending save-the-dates before your guest list is completely finalized, however, is one of the worst save-the-date blunders you can make, and here’s why. Once that save-the-date hits the mail, you’ve committed to inviting the recipient – even if you’re no longer speaking to them, sharing an office with them, getting along with them or what have you. So make sure you’ve checked your guest list once, twice and even three times before your save-the-dates hit the mail, because there’s no taking it back once it lands in someone’s mailbox. No matter how “celebratory” you may be feeling (at least during the first 20 or so envelopes you stuff), try and refrain from including glitter, confetti or any other messy items inside your save-the-dates. Your guests probably don’t want to have their excitement over the save-the-date ruined by having to haul out the vacuum or dustpan and brush to clean the floor. If you do want to include some type of enclosure, consider something less messy, like a photograph of the two of you or if budget allows, a small photo book of some of your happiest memories as a couple. It may seem that there is some type of etiquette rule for virtually every aspect of your wedding, and there probably is. Ultimately, whether you choose to follow each and every one is up to you and your future spouse. When it comes to save-the-dates, however, utilize this list. 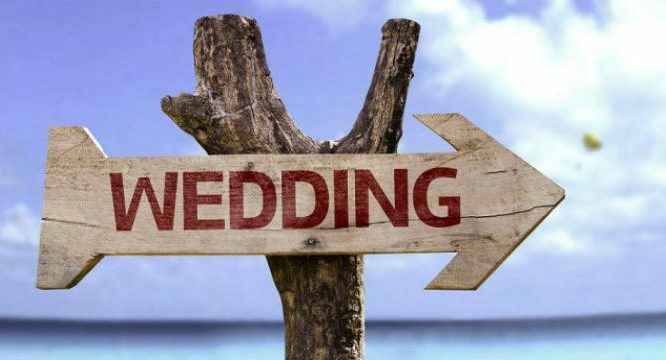 With any luck, your guests will be that much more likely to be able to attend your nuptials, and they’ll thank you for giving them the time and notification they need to plan travel, find dates, purchase the perfect wedding present and be there with bells on in time for your big day. About the author: Bryan Passanisi is currently living in the Redwood City, California area. He graduated from The University of San Francisco with his Bachelor’s Degree in Marketing. He has managed and written for a number of popular wedding blogs and is currently writing for Shutterfly. Follow us on Facebook or Twitter (@Top10Vendors) and get updated with latest wedding tips.